The Fellowship was fortunate enough to obtain a copy of REVOLUTION: AW YEAH! #1 from IDW Publishing. The story and art is by Art Baltazar. Baron Karza seeks to get his hands on the famous Orbsah Gem, thereby obtaining the “ultimate power in the universe.” With the gem he kidnaps Rom, Optimus Prime, and Snake Eyes and proceeds to take them to the Microverse. There he steals their power and abilities in order to take control of the universe. However, the appearance of these super-sized beings is affecting the Microverse. This imbalance draws the attention of the Micronauts and quickly realizes that Karza is behind it. Are they too late to stop him and reverse the damage he has already caused? When you see the name Art Baltazar, you have come to expect a fun all-ages tale. REVOLUTION: AW YEAH! Is no exception. I mean when Baron Karza kidnaps Snake Eyes to steal his coolness, I mean c’mon. 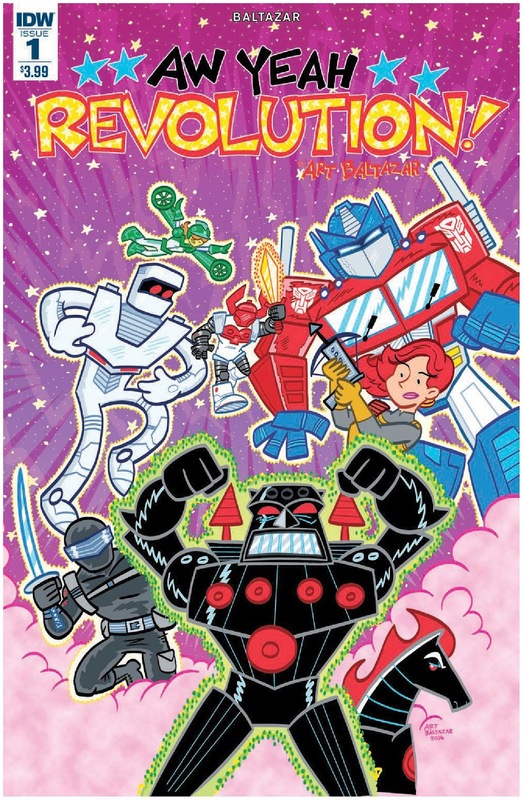 This should be a great little adventure that is accessible to anyone, not just the fans of the Hasbro characters or of the recently completed REVOLUTION crossover event. Check it out! REVOLUTION: AW YEAH! #1 is in stores now or available at www.idwpublishing.com.